Would you like to become a healthier version of yourself? Get your energy back to do the things you love? Feel happier, more present, and able to enjoy life more? Feel better and younger than you did 10 years ago? If you answered yes to any of these questions but fear that nothing can be done because your body has let you down and will never work the way it’s meant to, then I’m here to help you change all of this for you. I’m Caroline. I’m a mum and a wife, a daughter and a sister. I’m a former senior marketing executive and now I’m a Health Coach with a passion for helping people with autoimmune disease and chronic conditions to get their body and their life back and find a way to feel well again. 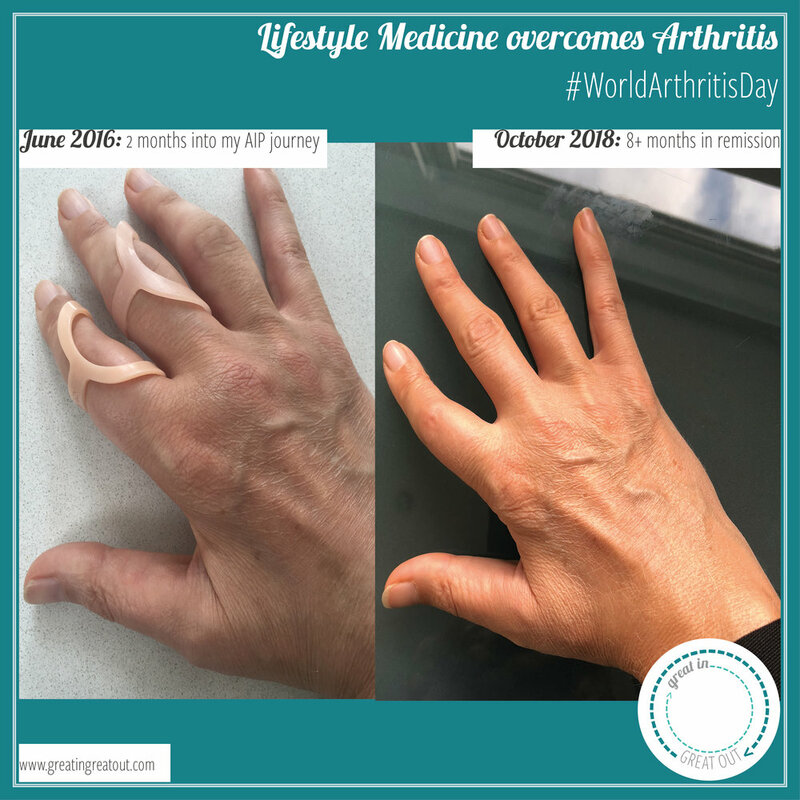 In 2012 I was diagnosed with not one but two autoimmune diseases - Rheumatoid Arthritis and Guillain Barre Syndrome, which forced me to spend 6 weeks in the hospital, paralysed. While I thankfully recovered and regained control of my body, Rheumatoid Arthritis is a life-long condition with (currently) no real cure. Medications to manage the symptoms are available, but they are very aggressive and come with a long list of nasty side-effects. After my shocking diagnosis, I went down the only route that was presented to me – I took the medications I was advised to take. I felt frustrated and powerless. I was subject to constant mood swings (and more often than not, they were not good!). I was in so much pain that holding hands with my children hurt. My little boy used to ask me whether he was squeezing my hand too hard. And he was barely even touching it. I wanted more from my life. But as time passed, I was getting worse and more disabled. It was only in 2016 that a nutritionist suggested I read The Wahls’ Protocol from Dr Wahls. I did, and one weekend I decided to cook the types of food recommended in the book. This had an immediate effect on my pain levels. And at that point I knew - nutrition and self-care held the key to health and wellbeing. This was the way forward for me. And yet, I was totally overwhelmed by the changes I had to make to my life and my diet. Getting healthy and staying healthy has since been a long journey. Like everyone, I have good days, and I have bad days. But I am in remission. I now have a huge amount of vitality and energy. I feel more present because I know I can enjoy my present. I feel better and younger than I did 10 years ago. I’m no longer in pain (and when I am, occasionally, I know what to do to get better again). I’m full of hope for the future. And despite what people think, I can still eat cake! Since my IIN health coach qualification, I have become a certified Autoimmune Paleo coach, and as of September 2018, I’ve been studying at the School of Applied Functional Medicine (SAFM), which will help me further my expertise and allow me to work with clients to understand the root causes of their dis-ease, using nutrition and other lifestyle medicine practices to overcome their conditions. Alongside my health coaching practice, I am also a dōTERRA wellness advocate. Essential oils have helped me reduced the toxic load in my household and personal care, as well as support my family’s healthcare needs, and this has also played an important part in my recovery. Now, I want to help YOU feel well again. In fact, I want to help you feel better than you ever did! Because I know it’s possible. Do you find yourself saying or thinking any of these things? I feel tired all the time and have no energy to do the things I want to do. I always seem to lose my temper. I’ve tried to eat healthily and/or exercise, but I don’t really know what I’m doing, and I can’t keep up with it. I have tried to lose weight, but nothing’s really working for me. In fact, I seem to be putting on weight instead of losing it! I struggle to fall asleep or wake up in the middle of the night and can’t go back to sleep until the early hours of the morning. If you can relate, I urge you not to accept this as ‘normal’. Pain and discomfort are signs of dis-ease in the body, and they should be addressed. Most of us will consider ourselves healthy just because we don’t have a diagnosed illness. And when we do have a diagnosis, we’re often led to believe that ‘it runs in the family’, or ‘it’s in your genes’, and nothing can be done. But believe me when I say this. Your body is strong. And provided with the right environment, it can go back to functioning as it should. So please don’t fall into the trap of accepting life as it is and believing that nothing can be changed. And I’m here to prove to you that being healthy is simple. So let me hold your hand - I promise I won’t squeeze it too hard! We’ll always go at your pace. I’ll give you the tools and the accountability you need to make tweaks to your diet and to your life, so that you can feel well again. In fact, you’ll feel a range of other emotions too. You’ll feel energised, relieved, surprised, and proud. But more than anything, you’ll feel in control again. Empowered. And I can tell you that’s just exhilarating. Are you ready to make a commitment to your health? I have no doubt about the fact that my love of cooking has made the process of switching diets easier for me. But like you, I was totally overwhelmed at first. And I got help – I have my own Health Coach! So I’m asking you to make a commitment. And if you do, I’ll be with you every step of the way. I’ll share my knowledge, my skills, and my personal experience. I’ll provide you with a method that works for you to implement the changes you want to make. For yourself and for your family. I’m asking you to make a commitment to your health. So, do you feel it’s time to make some changes to your life? Click here and book a free 20-minute consultation to find out how I can help you. I am French and moved to London in 1996. After a university degree, a few jobs in advertising, a house purchase, a Scottish husband and 2 London-born children, it’s safe to say I’m pretty settled here. I absolutely love London – it’s such a vibrant and multi-cultural city! Although I would love it even more if it was a bit sunnier (Vitamin D is crucial after all!). If you’d like to find out more about health coaching and the ways I can help, click here. And if you’re curious about why I’m an Autoimmune Paleo follower, you can read more here.